It looks like the kind of storefront that would have a pickle barrel and a couple of old men in rocking chairs out front. When driving on I–10 in Arizona, I often stop in Benson in order to eat at Reb’s Cafe—the fried chicken, the biscuits & gravy, the meat loaf, most of the diner-style food on the menu is great, and it’s a nice, friendly place to relax going between San Diego and Las Cruces. Recently I thought to do a search of nearby bookstores, and found one right nearby: Mary Ann’s Mostly Books. Mary Ann’s is a mess—cluttered, disorganized, books everywhere—but there are some great old books hidden in the mess. As I recall, there are shelves full of a lot of southwestern history, especially ghost towns, and I found some interesting old science fiction books on that small shelf. I also found some older political books. People talk about how Barry Goldwater was an early form of libertarian, and I’ve been wanting to pick up something of his. After reading Murrow and Advise & Consent, Why Not Victory? seemed like an obvious choice. It appears to be a book that argues that we don’t have to give in to Soviet tyranny in order to have peace; in the Murrow book I ran across several politicians and bureaucrats who believed, in 1963, that the Soviet planned economy must by its nature outpace a free American one. It will be interesting to read an opposing view. So it is now officially On The Table. That table is beginning to groan like Atlas under the weight. I just checked with Goodreads; so far I have read 106 books this year. Checking my database of books, I have purchased 162 this year. That is, as the environmentalists say, not sustainable. I’m gonna need a bigger table. If you regularly travel I–10, you know how barren it is of pretty much anything. Mary Anne’s is definitely worth stopping at; especially if you stop at Reb’s, which is also definitely worth stopping at. Besides Reb’s, if you’re in Benson you might also want to check out Singing Wind Bookshop. They have a lot of books; they tend toward newer books rather than older, and they have a slightly progressive bent. They are at the end of a long dirt driveway masquerading as a road, donkeys on the left, and a wide vista ahead. It’s on the owner’s ranch, literally off in the middle of nowhere. If you are in Benson and you have the time, it’s worth checking out at least once. Update: Reb’s has, sadly, closed as of June 2017. There are other good restaurants in Benson but I’ve yet to find one with the same old-school charm. I hope you get the chance to visit her store in Apache Junction. As you know, small bookstores like hers need all the help they can get. Thank you again for your support. 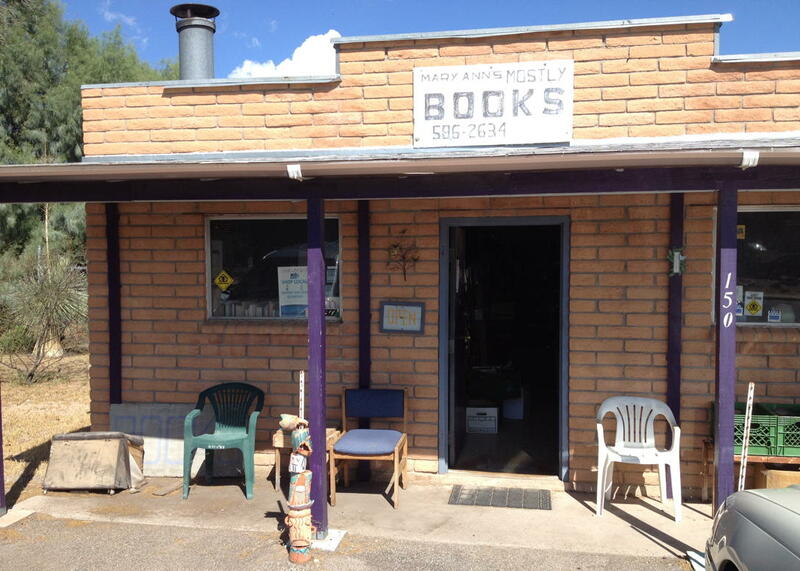 Benson, Arizona: Mary Ann’s Mostly Books last modified April 1st, 2018.